At Falcon Structures, we use a host of different adjectives to describe modified shipping containers. “Romantic” was not on the list – until recently. 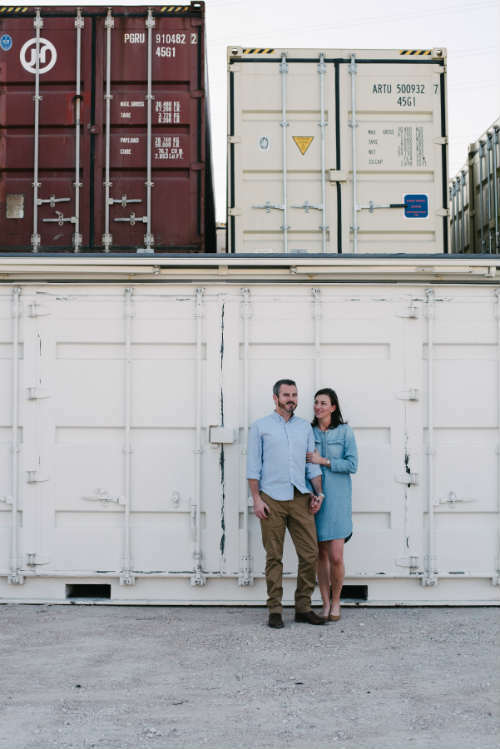 That’s when a lovely couple from Austin, Teel and Jason, contacted us to see if we would allow them to use shipping containers at Falcon’s Manor, Texas, headquarters as a backdrop for their engagement photos. After hearing the story of how the couple met, we couldn’t say no. You see, conex shipping containers were a constant presence in the place where Teel and Jason met, fell in love and became engaged - Bagram Air Base in Bagram, Afghanistan. For seven years, Teel worked in human resources for an engineering firm that had a Department of Defense contract. Of those seven years, she spent four in Afghanistan, where Jason was serving as a U.S. Navy pilot. In total, Jason served 12 years as a pilot in the Navy, with missions in Iraq, Afghanistan, and elsewhere. According to Teel, ISO shipping containers serve a variety of purposes on Bagram Air Base, including sleeping areas or billets, work areas, and shipping container restrooms. 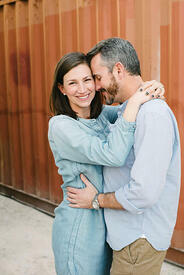 The couple met in a dining facility – or DFAC – then 10 months later Jason proposed to Teel inside a shipping container. “The day he proposed was my birthday. After lunch I was walking back to the shipping container where I stayed, and when I arrived, Jason was waiting for me with my birthday present, a box with five gifts inside,” says Teel. Attached to each gift box was a note from Jason describing five places the two visited during their first vacation together. The couple took a road trip around the southeast U.S., to get to know each other better, with the trip ending in Austin, Teel’s hometown. Along the way, the two also spent time meeting each other’s family and friends. New Orleans will also host Teel and Jason’s wedding over the 2017 Memorial Day weekend. Now a retired Naval Officer, Jason moved to Austin, where the couple purchased a home this past fall. Today, Jason is still flying an MC-12 aircraft overseas as a contractor for the government. Teel now works as a Realtor® for Sotheby’s Realty in the Austin area. Back to those engagement photos. We were delighted to share the place we call home with our new friends Teel and Jason, especially because our modified shipping containers bring back happy memories from the first few months they spent together. Who says shipping containers aren’t romantic? Not Teel and Jason. As you can see, Falcon's ISO shipping containers provided the perfect nostalgic backdrop that the couple envisioned for their engagement photos. Everyone at Falcon is so happy we could oblige. Congratulations Teel and Jason! You’re always welcome at Falcon, so whenever you need some more conex shipping container love, come back and visit.